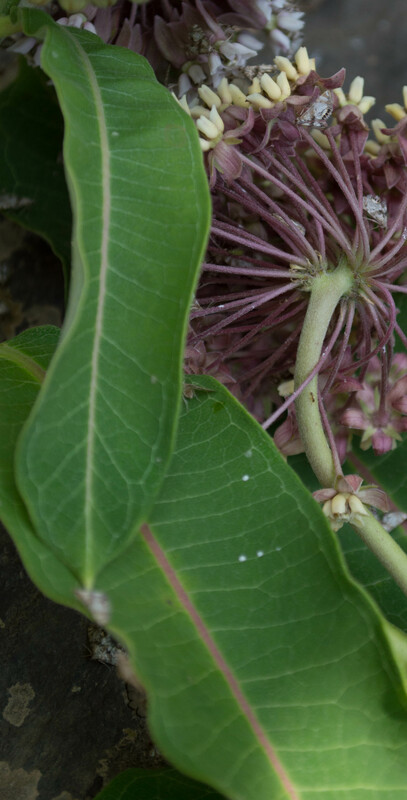 True to their name, milkweeds are both milky and weedy. “Milk” refers to the white latex found within, a chemical defense against herbivory. And the plants are weedy: some species are on US state and Canadian province weed lists. Farmers hate them because many species are tall plants with massive root systems that can out-compete crops. But most of the rest of us love them for attracting bees and butterflies. I love them because the flowers themselves are fantastically complex. The inflorescence is an umbel. Each individual flower consists of five sepals and five petals, and in most species five hoods and five horns. 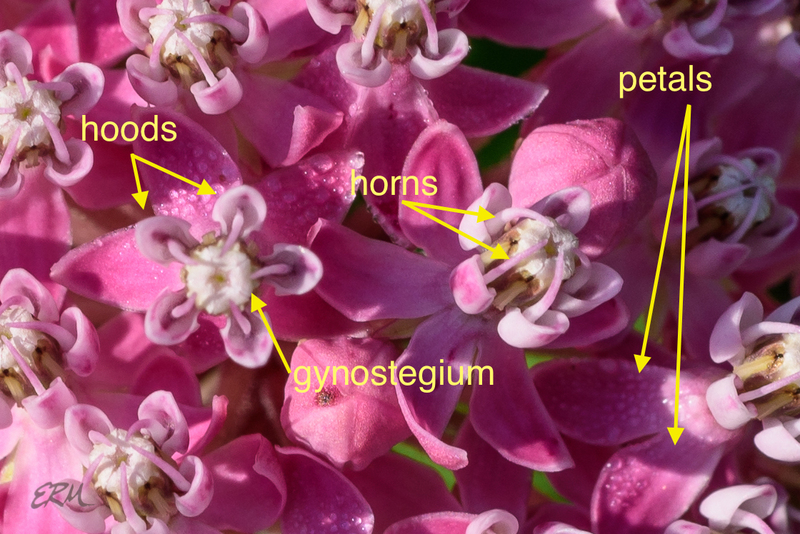 The hoods enclose the gynostegium, a complex structure consisting of fused stamens and styles that is unique to the genus Asclepias. It gets even more complicated than that; if you’re interested in the topic, there’s a detailed but not too technical explanation at the Orbis Environmental Consulting website. The genus Asclepias was once placed in its own family, Asclepiadaceae, which is what you’ll find in older texts. Currently it’s place in the Apocynaceae (dogbane family), subfamily Asclepiadoideae. 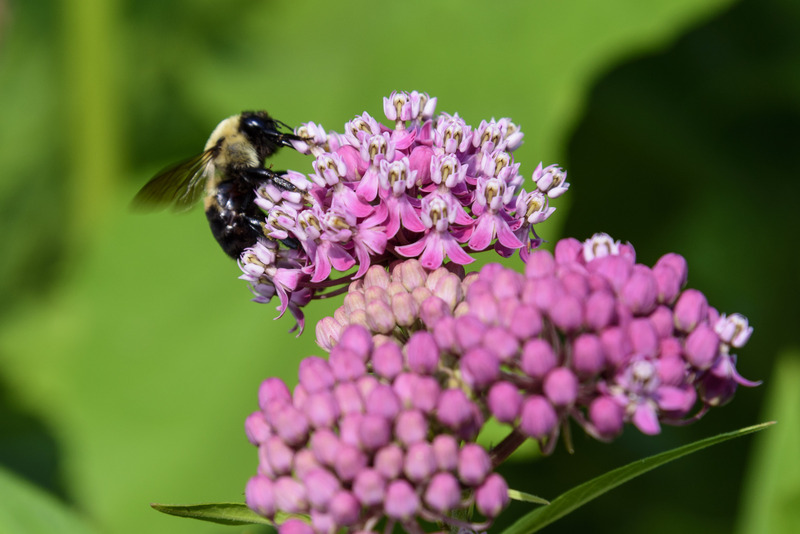 A dozen species of Asclepias can be found in Maryland, all native and all but one occurring in the Piedmont. 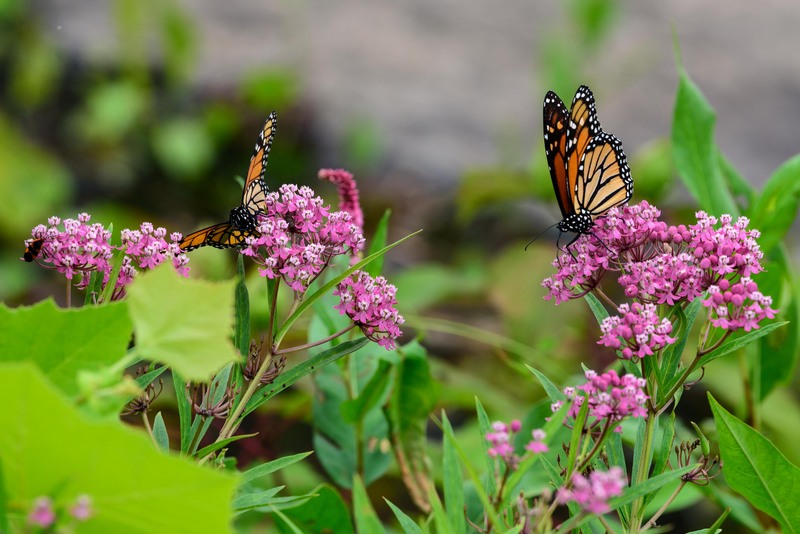 Asclepias incarnata (swamp milkweed) is found in most of the US except Alabama, Arizona, and the Pacific coast states, and in the eastern half of Canada. 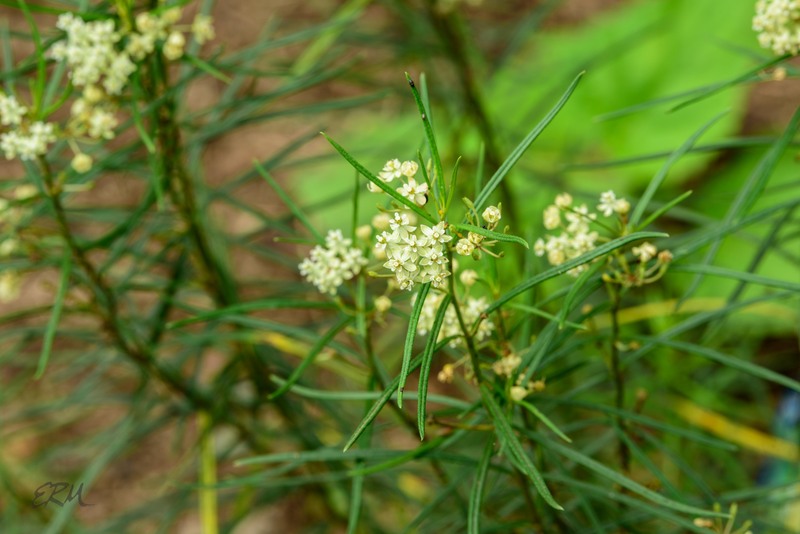 It prefers wet soils, and can grow two to six feet tall. 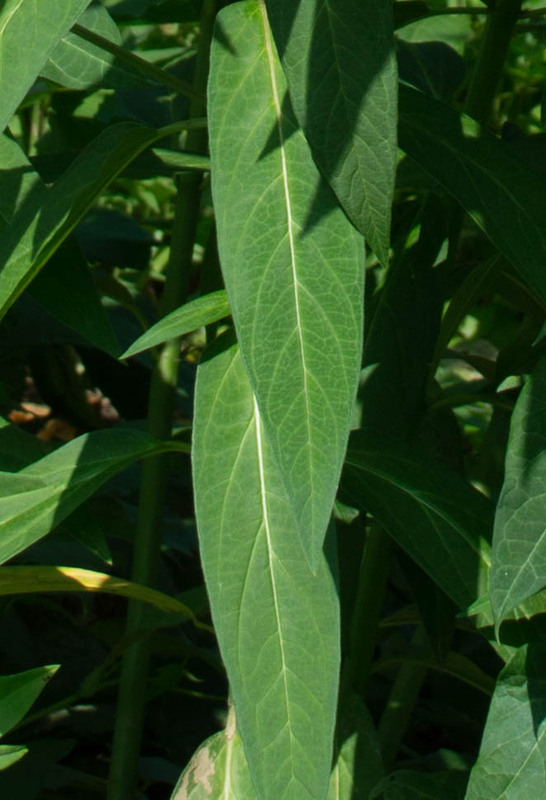 The leaves are narrower than those of most other milkweed species. In the Potomac Gorge I’ve seen it blooming from late June to late August. 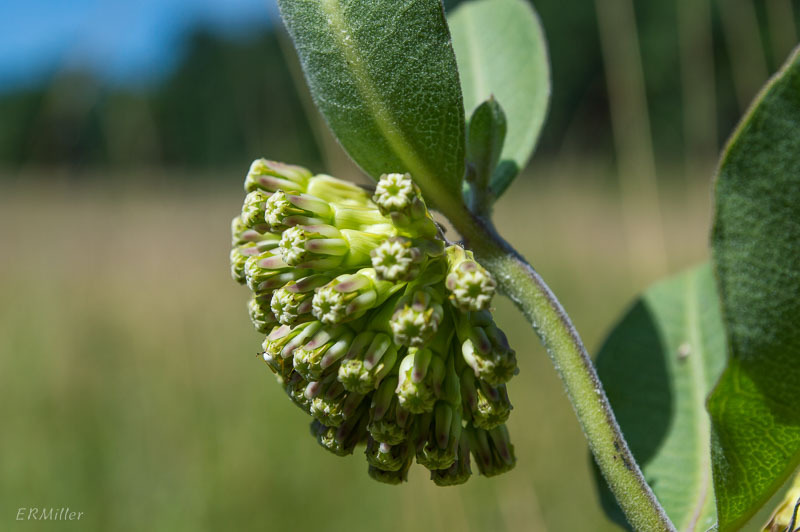 Asclepias quadrifolia (four-leaved milkweed) has a more limited range: it’s found in Ontario and the eastern half of the US, excepting some of the northernmost and southernmost states, and seems to be concentrated in the Appalachians and the Ozarks. It’s endangered in New Hampshire, threatened in Rhode Island, and uncommon in Vermont (per the New England Wild Flower Society). The species prefers drier soils in woodlands. The whorl of four leaves makes it easy to identify. Asclepias syriaca (common milkweed) is found in the eastern US and Canada and a few western states, generally in full sun on dry or poor soils. In the Potomac Gorge I find it in soil pockets on the bedrock near the river, blooming in mid June to mid July. It’s on several authorities’ weedy plants lists. 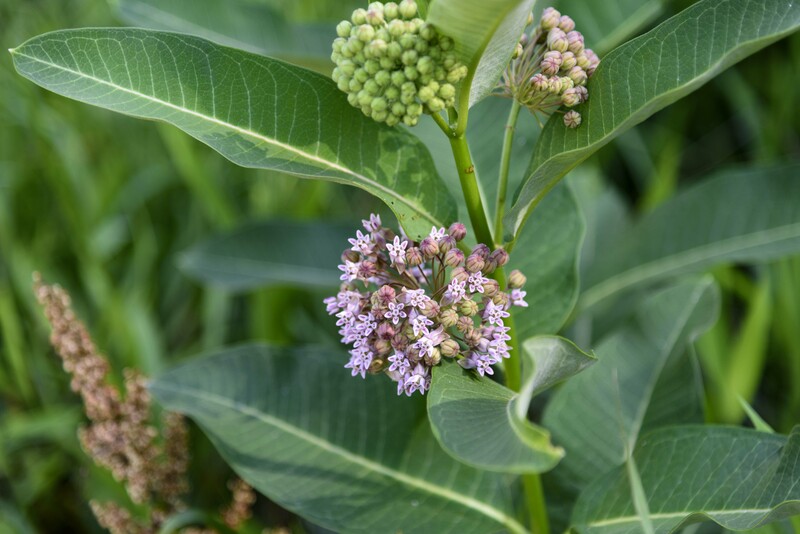 The flowers are a dusky pink as opposed to the bright pink of swamp milkweed, and the leaves are much broader. Asclepias verticillata (whorled milkweed) is found in most of the eastern and central US and Canada, in open areas with full sun and poor soils. It’s on several weedy plants lists, but is also threatened in Massachusetts and special concern in Rhode Island. In Maryland it’s S3/watchlist. I’ve never seen it in the wild; the plant pictured here survived the rabbit onslaught in my garden. Note how narrow the whorled leaves are. Asclepias viridiflora (green comet milkweed) is widespread across the US and Canada, though missing from the West and most of New England. It’s endangered in Florida, threatened in New York, special concern in Connecticut. It’s uncommon in Maryland; look for it blooming from mid June to mid August in dry open areas, especially serpentine barrens. This last one is not technically a milkweed, but it’s close. 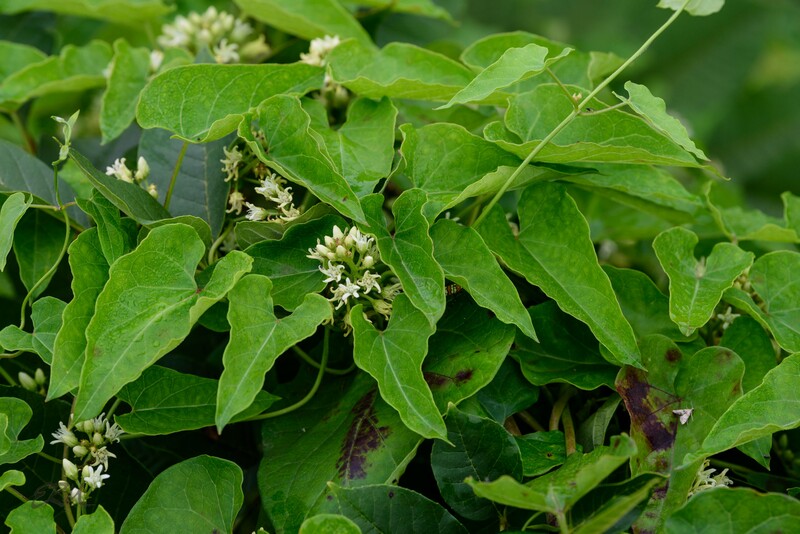 Cynanchum laeve (honeyvine) is a sprawling vine that’ll grow up and around everything, so it is weedy. And it does exude latex. And monarch caterpillars (and other milkweed butterfly caterpillars) do feed on it, so you may as well think of it as a milkweed. 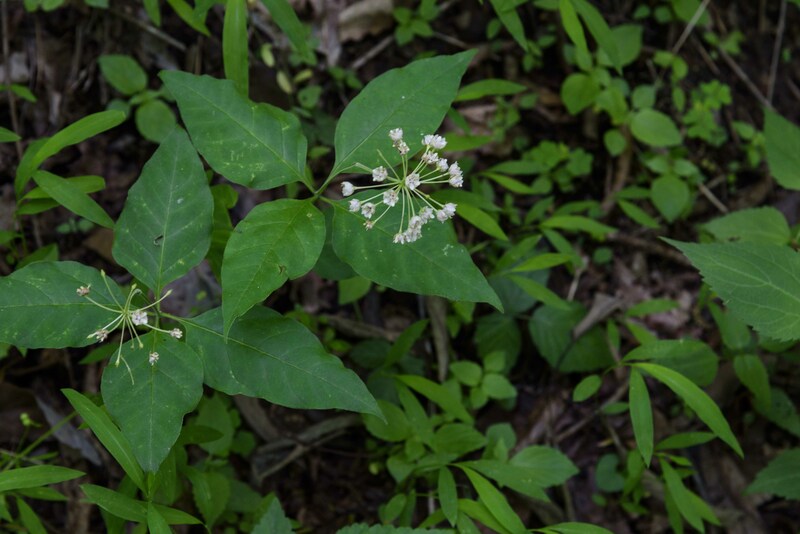 In Maryland it’s found in the coastal plain, and also in the Piedmont part of Montgomery County. 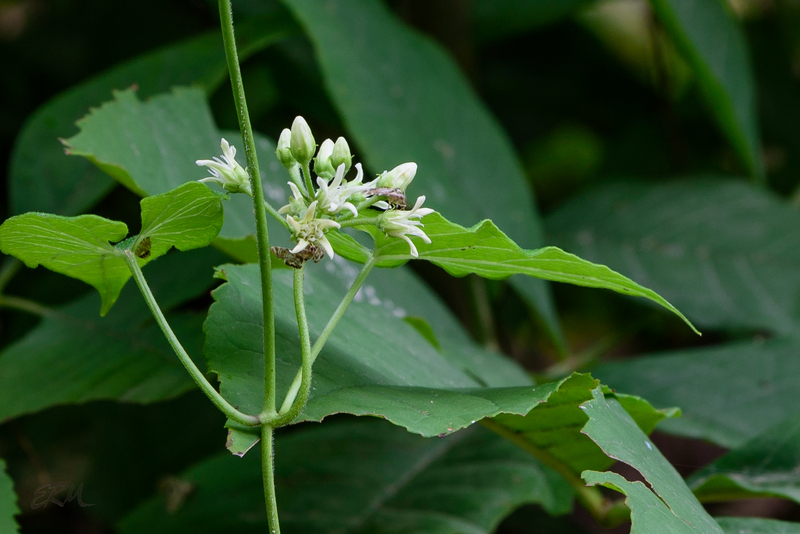 I’ve been seeing it along the banks of the Potomac, twining ’round late-flowering thoroughwort, rosemallows, and anything else it can get to. This entry was posted in Uncategorized and tagged Apocynaceae, Asclepiadaceae, Asclepias, Cynanchum, milkweeds by elizabeth. Bookmark the permalink.